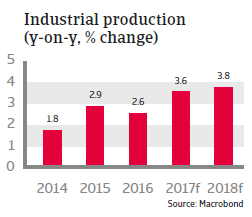 GDP is forecast to increase by more than 3% in 2017 and 2018, as household spending is spurred by low interest rates and an improving labour market. After the snap elections held in March 2017 Boyko Borisov from the centre-right GERB party became Prime Minister for the third time. He heads a coalition government of GERB and the nationalist “United Patriots” party, with just a slim majority in parliament (122 of 240 seats). The snap elections became necessary as the previous government under Borisov had resigned after Rumen Radev, a socialist–backed pro-Russian won the November 2016 presidential elections. Political discontent remains high, especially over the slow progress in combating graft and corruption and social welfare issues. While the incumbent government pursues a pro-EU policy, the socialist party and President Radev favour closer political and economic relations with Russia. Bulgaria recorded weak GDP growth after contraction in 2009, averaging only 0.9% annually between 2010 and 2014. However, economic growth has accelerated since 2015, driven primarily by stronger exports and growing private consumption. 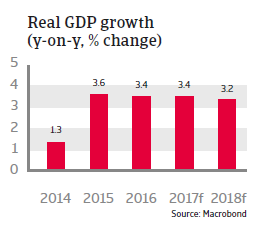 GDP is forecast to increase more than 3% in 2017 and 2018, as household spending is spurred by low interest rates and an improving labour market. Unemployment is expected to decrease to about 8% in 2017. 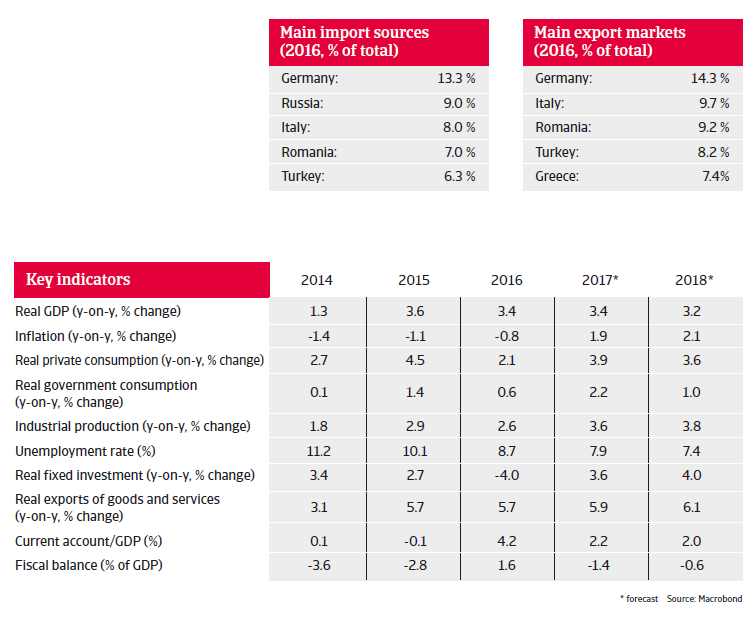 At the same time, exports continue to be driven by increased eurozone demand, and investments (including EU-financed infrastructure projects) are expected to pick up again. After a deflationary period between 2014 and 2016, which has severely affected the profitability of Bulgarian businesses, consumer prices increased again in 2017, due to higher energy prices and strengthening domestic demand. After a surplus in 2016, the fiscal balance is expected to turn to a modest deficit in 2017 and 2018. 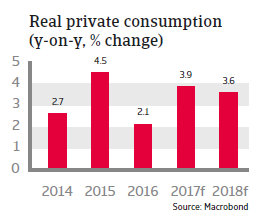 Rising private consumption and imports are boosting revenue collection. Public debt remains sustainable and is forecast to steadily decline (to reach 28.5% in 2018). 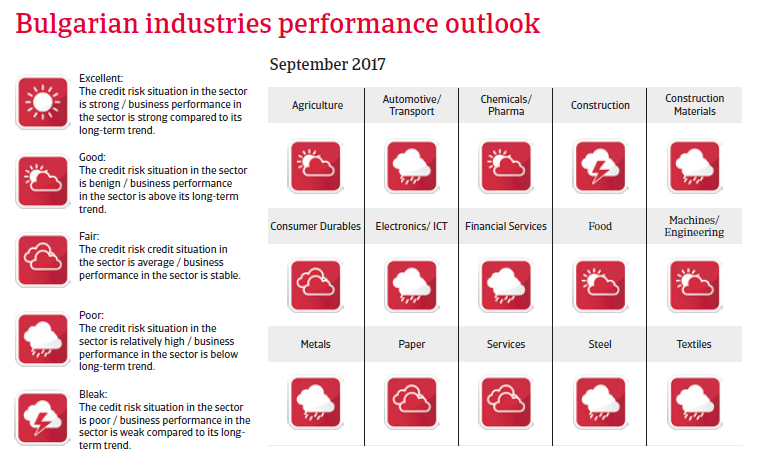 After a banking crisis in 2014 the sector has made big improvements, with the IMF’s 2016 banking sector assessment and a stress test made by the Central Bank showing that the sector is well-capitalised and more resilient to shocks. However, 14% of total loans are still non-performing, which continues to be a threat to bank profitability. Greek banks contribute more than 18% of the banking assets in Bulgaria, which exposes the sector to adverse developments in the Greek economy. Bulgaria’s monetary policy framework is strong with a solid commitment to its currency board arrangement (the lev is pegged to the euro), which supports foreign investor confidence. However, this arrangement limits Bulgaria’s ability to combat external imbalances. The peg is maintainable due to large international reserves (10 months of import cover) and current account surpluses. Political instability remains an issue for Bulgaria´s long term economic growth prospects, while corruption and red tape still hamper the business environment. Despite a decrease in the jobless rate, long-term unemployment remains a big social and economic issue, accounting for more than 60% of unemployment. The high level of emigration and an ageing population also add to the woes of the labour market and reduce the potential for long-term growth.